Water Requirements: Low once established. ‘Firepower’ is a tiny shrub that packs a lot of punch! 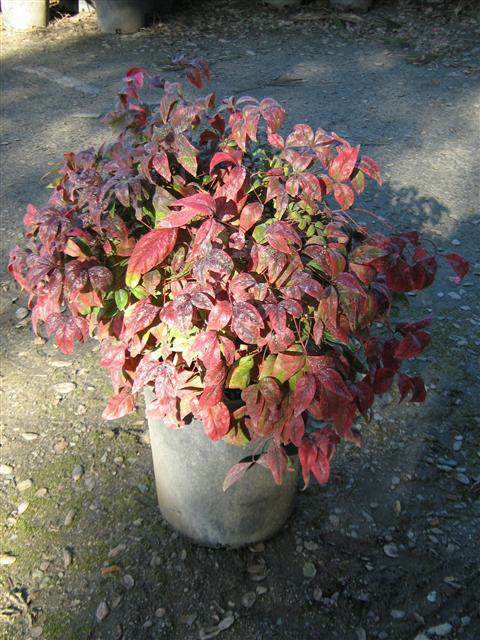 This non-invasive selection of Nandina domestica offers up evergreen foliage and an intense show of fall color. The new foliage in spring will emerge in a flush of pale green, with variations of yellow and green in the summer, followed by deep red foliage in the fall. This particular Nandina typically does not flower or produce berries as often as its parent species, therefore it doesn’t spread aggressively. This is truly a compact shrub, growing only 1-2’ tall and wide, with very dense foliage growth. It’s perfect for use as a short foundation shrub, front of the border foliage specimen or even container plant. ‘Firepower’ is an incredibly versatile plant that can be grown in full sun to full shade. Expect foliage color to be much more intense in sunny locations. Nandina will tolerate very hot dry summers and just about any soil type. They do, however appreciate good drainage and are very drought tolerant once established. Few if any pests or diseases are a problem for ‘Firepower’. If your landscape won’t receive much TLC, this is the perfect plant!